A global brand for hot water supply, Rinnai has been operating for close to a century, with more than 40 of those years in Australia. There’s comfort to take in that, as Rinnai understands the Australian climate and the habits of Australian households, meaning that its products are shaped to fit seamlessly into our day-to-day lives. With Rinnai also having the feather in its cap for being the first to launch a fully electric continuous flow system, the company strives for improvement, meaning better systems for consumers now and further down the line. Check out its range of hot water systems in this review. 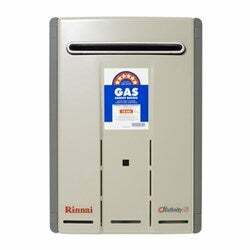 Rinnai keeps it simple with its gas storage systems, providing two HotFlo models for consumers to choose from. Both contain vitreous enamel lined steel tanks, allowing for long life, with both models also coming with an 8-year warranty on cylinder parts. The Medium size model, a 135L capacity unit, has a high first hour capacity, suitable for the majority of households or those with higher water usage. 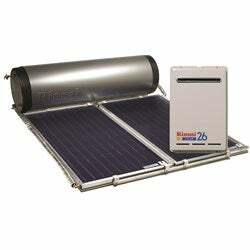 With a 4.7 star energy rating, the HotFlo models will also ensure that your electricity bill is kept low. The Large model, capable of storing 170L, will suit larger households, with a high first hour capacity and fast recovery system. The larger model comes with a slightly lower energy rating, but is still competitive enough on the environmental efficiency front to warrant some interest if you’re in the market for large hot water systems. Offering a plethora of models, Rinnai have an electric model for any household size. Ranging from 25L up to 400L, the electric HotFlo systems can be stored both internally and externally depending on the model, allowing households with limited space to find the perfect fit. Rinnai also provides twin element configurations for the larger models, starting at the 160L capacity unit. Essentially this is a second heating unit, ensuring that larger households continuously have hot water, and that energy isn’t wasted. With the bragging rights for the first continuous flow hot water system, Rinnai is arguably a leader in this field, with its products backing up the claim. Offering 10 models, Rinnai may be a good bet if you’re after a continuous flow system. Of the 10 models available, the environmental variations stand out, with Rinnai producing Australia’s first 7-star energy efficient water system, which creates 1/6th of the emissions of the standard electric hot water system, giving consumers peace of mind when it comes to environmental sustainability. 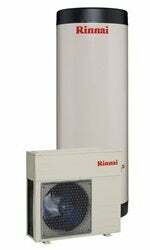 Of course, the variations on offer don’t come cheap, but considering what Rinnai is producing, the price tag may be worthwhile. Rinnai also offers its HotFlo 10 model, which requires no outside power to operate, making it perfect for households in more remote locations. With a 5.6 energy rating, it’s also recommended as a replacement unit for older models. Rinnai is also looking to take the lead with solar powered systems, with the company providing high quality, efficient models that would suit all types of Australian climates. Providing models to be either mounted on the roof with the solar panels (close coupled systems) or grounded tanks, households will be able to find a model suitable to their needs. The coupled systems – known as the Prestige models – have a tank capacity of 180L-300L, suitable for middle to large households, with one or two solar panels provided depending on the tank size. Rinnai also offers Colourbond colours so that the system fits in with your aesthetic. The grounded systems, also suited for larger households, have even bigger capacities than the coupled systems – a benefit to not being mounted on the roof. With the smallest capacity 250L, Rinnai ensures that consumers get the most out of its system. As not all areas and regions of Australia are suitable for solar panels, Rinnai also offers a heat pump to help households save on power bills. Rinnai’s split HotFlo system works like a reverse fridge, in that it transfers heat found in the air outside into the system to heat the water. The HotFlo system is made of stainless steel and comes with a 10 year warranty, and generates up to 700L per day, meaning that it’s good value for money for larger households. 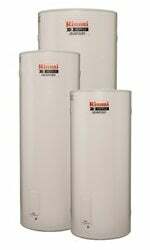 Is a Rinnai hot water system worth the money? The purchase of a hot water system is more dependent on individual factors such as household water usage and household size, as well as location and climate factors, meaning that it can be quite a unique purchase. Thankfully, companies like Rinnai understand this and provide a wide variety of products and model variations to suit individual households, as well as the general Australian climate. While most of its water systems are on the higher end of the price market, so is the quality, with Rinnai certainly a driving force within the hot water industry. If you’re looking for a quality system that should last the test of time, Rinnai seems worth considering.